ALEXANDRIA, VA – The growth of vehicles running on alternative fuels will accelerate over the next decade, but diesel fuel- and gasoline-powered vehicles will continue to dominate market share, according to “Tomorrow’s Vehicles: What Will We Drive in 2023?” a new report released today by the Fuels Institute. For light-duty vehicles (passenger vehicles and light trucks), gasoline-powered vehicles will continue to dominate the market, although overall market share could decline from 93% in 2012 to as low as 82% of vehicle inventories in 2023. Diesel-powered vehicles will potentially comprise nearly 7% of the market while flexible-fuel vehicles capable of using E85 could grow to more than 9% of the market. Meanwhile, for medium- and heavy-duty vehicles (commercial vehicles like trucks and buses), diesel-powered vehicles will prevail, representing at least 94% of the vehicle fleet in 2023. Given that there are more than 250 million vehicles on the road today, it will take years of strong sales of alternative fuel vehicles to reshape the country’s vehicle fleet. In addition, a variety of developments — including cost reductions for alternative-fuel vehicles, conveniently available refueling options, expanded vehicle range and overall consumer familiarity and confidence with new fueling options — will need to occur before alternative-fueled vehicles can capture significant market share. The Fuels Institute, founded by the National Association of Convenience Stores (NACS), is a non-profit, research-oriented think-tank dedicated to evaluating the market issues related to consumer vehicles and the fuels that power them. It commissioned Navigant Research to provide a forecast of the vehicles market through 2023 that captures approximately two generations of vehicle development, providing a reliable look into the future but not reaching so far into the future as to be rendered unreliable. The report forecast the makeup of the vehicle fleet in 2023 based on two scenarios: a “base case” that incorporates current forecasts and an “aggressive case” that assumes more robust world economic conditions that further spurs demand and prices for petroleum products. In both projections, gasoline-powered vehicles will continue to dominate the LDV market but lose significant market share, dropping from 93.2% of LDVs on the road in 2012 to between 82.6% to 86.0% in 2023. This decline in market share is driven by a shift in the sale of new vehicles, with gasoline-powered vehicles’ share of sales falling from 83.4% in 2012 to between 67.6% to 78.9% in 2023, a potentially dramatic change in consumer purchasing behavior. Diesel-powered vehicles are expected to see strong growth in the LDV market, growing from 2.0% of all LDVs in 2012 to between 3.7% to 6.7% of the LDV fleet in 2023. This surge in market share will be led by the sales of new vehicles hitting the market. Diesel-powered LDV sales are expected to comprise between 7.2% to 17.8% of new LDV sales in 2023. With respect to medium- and heavy-duty vehicles (M/HDV), diesel fuel will see a slight decline, with its market share dipping from a near-ubiquitous 99.4% in 2012 to between 94.6% to 97.5% in 2023. The primary competition to diesel fuel in the M/HDV market will be natural gas. Flexible-fuel vehicles: Flexible-fuel vehicles (FFV), which can use both gasoline or E85, show the most promise for growth. In 2012, only 4.7% of LDVs were flexible-fuel vehicles; however, automaker production is forecast to double FFV’s share of the market to 9.3% of the fleet by 2023. However, the potential for this alternative fuel is tempered by lackluster existing demand and limited availability of E85. Natural gas vehicles: The number of light-duty natural gas-powered vehicles (NGV) is expected to see at least a ten-fold increase over the next decade, but will still only represent 0.43% in the aggressive case. However, in the M/HDV market, compressed natural gas is projected to capture up to 3.8% of the market in the aggressive case. The high cost of installing natural gas facilities at retail and the cost of vehicle conversion or production will be factors limiting additional growth by 2023. Propane-vehicles: Propane-powered LDVs are expected to double market share, but will grow from only 0.04% to 0.07% of all LDVs by 2023. For M/HDVs, propane is currently the second-most-popular option after diesel fuel, capturing 0.38% of the market in 2012. However, its growth is considered limited to mainly medium-duty vehicles and will account for no more than 0.76% of the M/HDV fleet in 2023. Battery-electric vehicles: Unless there are significant breakthroughs in battery-charging technology, battery-electric vehicles (BEVs) will not break out of the niche category of LDVs over the next decade. Even with a projected 22- to 26-fold increase in annual sales over the next decade, BEVs are forecast to be no more than 0.72% of the LDV market in 2023. 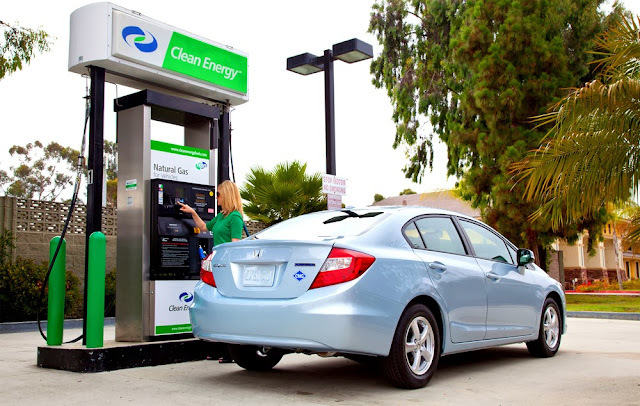 Fuel cells: Fuel-cell vehicles (FCVs), electric vehicles that use an external fuel source like hydrogen, are also expected to remain a niche category. Sales are expected to increase significantly over the coming decade, but the reality is that there were only 500 FCVs on the road in 2012. Even in the most aggressive forecast, registrations are only expected to reach 70,000 vehicles — 0.02% of the LDV market — in 2023. The Fuels Institute’s governing structure incorporates a diverse set of stakeholders including, but not limited to, fuels retailers, fuels producers and refiners, alternative and renewable fuels producers, automobile manufacturers, environmental advocates and consumer organizations. It will continue to commission and publish comprehensive, fact-based research projects that address the issues identified by the affected stakeholders. These projects will help to inform both business owners considering long-term investment decisions and policymakers considering legislation and regulations affecting the market. Founded in 1961 as the National Association of Convenience Stores, NACS is the international association for convenience and fuel retailing. The U.S. convenience store industry, with more than 149,000 stores across the country, posted $700 billion in total sales in 2012 and sells more than 80% of the motor fuels purchased in the United States. NACS has 2,100 retail and 1,600 supplier member companies, which do business in nearly 50 countries.